Dizgraceland: But can I be found? Was blind, but now, I have TV. No I haven't found religion, but I do watch LOST, the television series. It is a program about miracles, the first one being that it has been on for almost two years now and has only covered three months of the lives of an airplane load of people stranded on a tropical island (which in reality is Hawaii). The second miracle is that these people are stranded on a tropical island with umpteen beautiful beaches and not once has someone tried to sell them Chiclets or wood carvings. A majority of LOST's multiple storylines take place in flashbacks. I have watched LOST from the beginning and I am still amazed at the writer's abilities to keep track of these multiple storylines. I'm still trying to figure out what the polar bear that was shot early in the series was doing in Hawaii. I mention LOST only because I like the program, it was on last night and I've been feeling that way lately about blogging....lost, that is. This is not to say that I ever really had a direction I was headed with my blog. But even the television series LOST claims that everything happens in it for a reason. Sometimes I believe that. I believe I write about certain things at certain times for a reason. But sometimes I lose that feeling. And then I really feel lost. It's that "Horton Hears a Who" feeling again of shouting to be heard, but this time I can't even hear my own voice. But then again, I think we all lose our way at times. Even Rose almost stopped blowing her whistle at the end of Titanic (after breaking Jack's dead hand from her grip and letting him sink to the bottom of the ocean...a symbolic moment if I ever saw one). But against all odds she decided to keep trying to be heard and was rescued. Not that I'm looking to be rescued...just heard. "Can you hear me now? Good..."
Hey, you don't have to tell any of us about blog angst. We all probably have it--like spring fever. 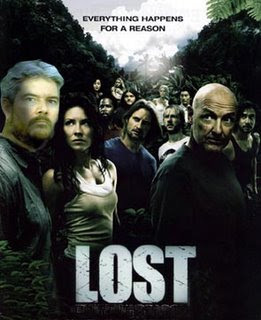 I don't watch Lost. I watched the first two episodes and realized we were going to have to live through the same plane crash 80 times (or however many survivors there were), and, with a healthy phobia about flying, that was a bigger commitment than I could make. On a completely unrelated note, I found a John Knox in the 1830 Census for Xenia, OH (evidently Martha's husband and George's father). He was probably born in the 1780's. Perhaps you had already found this? If not, now you know! Kristy, You are a person of amazing talent. Now you have either created a new identity or stole one. Regardless, thanks for finding George's father. I hadn't found him yet. I greatly appreciate it. Yea, between trolls, grasping for inspiration, a spouse that thinks blogging is dumb, and other lovely distractions, I feel lost myself, but then again I'd probably be lost altogether if I just gave up on it. But, it's a fluid universe we blog in, people come and go, life goes on, so it's true, the one rock solid constant here is inconsistency. Well stated THE Michael. You are a rock in a fluid universe. May the river never wear you down. Have never seen an episode of "Lost". I haven't seen a television show in months now. I know exactly what you mean by being lost blogging. I'm surprised you haven't felt this way more often. You have lasted longer than anyone I know, posting brilliant stuff several times a week without batting an eye. And, you're saying that you're lost. I don't believe it. We all hear you. If you're lost, then so are we. Shandi, That's the funny thing about LOST, the series. No matter when you jump in to watch it,you are still a little bit LOST. Thanks for understanding my lostness when it comes blogging. Hey, I could be the Lostness Blogger. Lostness Blogger!!! That's a great pun. That was a pun right? Play on words? Whatever it is, I imediately saw your face on the monster. Not a bad idea. Shandi, Lostness Blogger is a pun of sorts, but more of a crime against grammer. And I'm flattered you picture my face on a monster. You know of course what I need to do now?